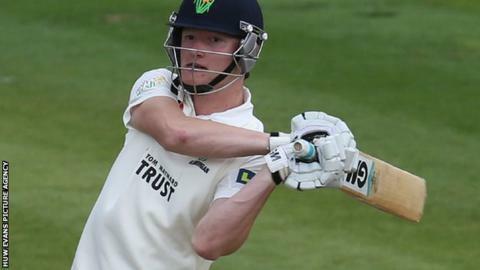 Aneurin Donald has scored two half-centuries for the Glamorgan senior side. Aneurin Donald hopes to play senior cricket for England after being chosen to lead the under-19 team. The 18-year-old will captain England in a five match one-day series against the Aussies in August. The Welshman has already led England in the final match of their series against Australia in April this year. "[Playing Test cricket] is the ultimate aim, though you take it step by step," added Donald. Geraint Thomas was born in Papua New Guinea to Welsh parents. "I'm aiming to break through into the [Glamorgan] first team and if I'm the next Welsh cricketer to do that [play for England], then even better." Fast bowler Simon Jones and wicketkeeper Geraint Jones were the last Welsh players to represent England in Test matches - both played in the 2005 Ashes series while Geraint Jones played his last Test in the 2006-07 series against Australia. In total, 16 Welshmen have played Test cricket for England. Donald has impressed at county level with half-centuries in his first two Championship matches, against Hampshire in September 2014 and Essex at Chelmsford this season. He says he enjoyed his first experience of leading the young England side and is delighted to take on captaincy duties. "It's something I enjoy being a specialist batsman with my bowling being frowned upon. "It's a good way of keeping in the game, I'm always thinking about it regardless of whether I'm captain or not, it keeps my brain ticking over and I enjoy a little bit of power," he joked. Donald's talent was honed on the same field in Gorseinon as Wales and British and Irish Lions full-back Leigh Halfpenny, who used to practice his goal-kicking at the same time as Donald was batting in nearby nets. "My father and brother and me used to go down to the nets and see him out there on the pitch, kicking goals while we were hitting balls," said. "So if my practice was anywhere as good as his, hopefully I'll be heading the same way as him but in terms of cricket success. He's been to watch Gorseinon cricket club in the past and he's a great guy." Donald also has cricket in the blood. His great-uncle Bernard Hedges, was a sixties stalwart for the Glamorgan and cored their first ever limited-overs century. "I knew him a bit, he was a great guy and it's my little connection so I've got to fly the flag for the family," he added.